Hello! I'm so excited to be sharing another monthly make today. I think this may be the fastest I have ever made a project before. I spend two whole days doing pretty much nothing but working on this vest in order to get it done before the end of the month. It was a bit of a challenge, but it was so worth it. I knew that at some point this summer I wanted to make a pretty vest with fringe so when I was drawing a blank on what to make for the month of June I knew a vest would be perfect. It was so hard to choose which one though. I've been seeing so many beautiful boho vests being created by all the wonderful makers on Instagram and couldn't wait to make one too. I finally decided to order the kit for the Whispering Birch Bohemian Vest by Olivia from Hopeful Honey while browsing the Lion Brand website. Luckily the kit was on sale so it only cost about $18! 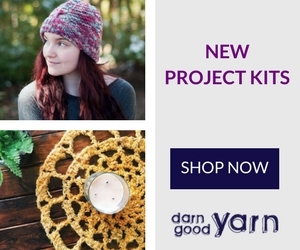 The kit comes with 4 or 5 skeins of Lion Brand's 24/7 cotton in Camel and a printed pattern. It took a bit longer than expected for the yarn to arrive so I knew I had to hustle if I wanted to make it within the month of June. I only had one week and actually got it done over three days. It's a relatively simple pattern and it was easy to get into a nice rhythm with the pattern repeats. I made the M/L size and decided not to add the ties. The only hiccup I had was when I realized that the printed pattern that Lion Brand sent in the kit had some errors! It was a good thing I knew that the free version was on the Hopeful Honey website because I quickly looked it up and saw that the correct version is online. If you are thinking of ordering the kit from Lion Brand, just know that it's a good idea to also look up the pattern online to make sure you are making the vest correctly. The biggest error I saw was that for the M/L size, on the back panel when you are supposed to repeat rows after decreasing, it says to repeat rows 51 & 52, but it should really be rows 53 & 54. It also seemed that some of the picot repeat counts were off, but I don't know if that was a mistake in the pattern or a mistake on my part. Either way, I was still able to create a beautiful vest. I blocked my pieces on large foam mats and used the steam method. It was super easy and it dried fast so I could sew up the seams that same day. Blocking is a must for this kind of pattern, it helps so much when joining the different panels and really shows off the details of the stitches. This was my first time adding fringe to a garment and I love it! Not all of my pieces ended up the same length, but I easily just trimmed them up when I was done. I also had to start a new skein of yarn for the fringe so the pieces were a bit wrinkled. A quick hit with some steam and a little tugging and they all laid perfectly straight. I had so much fun making this vest and Olivia did such an amazing job creating this pattern! I can totally see myself wearing this to some of my craft shows coming up this year. If you don't already follow Olivia, you can find her on Instagram or at the Hopeful Honey website. She is an amazing designer and has some of the most beautiful crochet patterns and they are free on her blog! Thanks so much for following along with this monthly make series. It has been so much fun and also so challenging, but I am loving all the pieces I'm adding to my wardrobe. Will you be adding this pattern to your list to make? I'd love to know! Comment below or send me a message. You can find the free pattern here or get the kit from Lion Brand here. 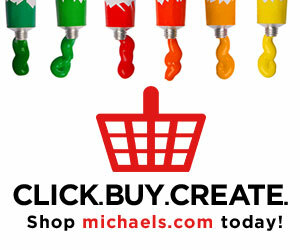 Hi, I'm Meghan, the creative mind behind Meghan Makes Do. I hope you find some inspiration while you are here. Stay up to date with the latest from MeghanMakesDo. We respect your privacy. Meghanmakesdo will never give your personal information to a third party.